Description: In modern research, the Pastoral Epistles still receive much attention but are also still highly disputed. Focusing on the personal notes in the letters, there have been many attempts to explain the pseudonymity of the Pastorals with regard to genre and intention. In his book, Joram Luttenberger analyzes the literary and epistolographical characteristics of the Pastoral Epistles in light of ancient epistolary theories as well as the documentary papyri in order to re-evaluate the literary character of the letters. The focus on the documentary papyri is particularly interesting, because these corpora have not yet received the attention they deserve. The papyri shed much interesting light on the Pastoral Epistles and allow a new approach to their interpretation. Citation: Korinna Zamfir, review of Joram Luttenberger, Prophetenmantel oder B�cherfutteral? 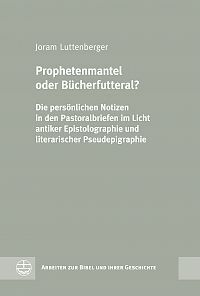 Die pers�nlichen Notizen in den Pastoralbriefen im Licht antiker Epistolographie und literarischer Pseudepigraphie, Review of Biblical Literature [http://www.bookreviews.org] (2016).